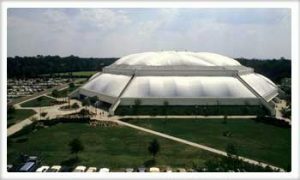 Greetings | The Stephen C. O'Connell Center welcomes you! If you have any questions about visiting our venue, please contact the Box Office at 352-392-1653, that's 3. 5. 2. 3. 9. 2. 1. 6. 5. 3. or the O'Connell Center administrative offices at 352-392-5500.
WHO IS STEPHEN C. O’CONNELL? Stephen Cornelius O’Connell was a UF alumnus, attorney, appellate judge and sixth president of the University of Florida. After growing up in West Palm Beach, O’Connell attended UF from 1934-1940, where he served as president of Alpha Tau Omega, his sophomore class and the student body. 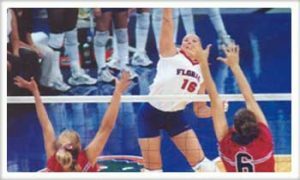 A star athlete, he was captain of the Florida Gators varsity boxing team, setting the record for fastest knock-out and winning the SEC middleweight boxing championship. He also helped coach the team in the late 1930s. After an active tour of duty in Australia with the U.S. Air Force during World War II, O’Connell served 12 years on the Florida Supreme Court. In 1967, he became the first alumnus in the history of the university to be appointed president. During his six year term, 1967-1973, he guided the university through a tumultuous era of student protests. He oversaw the integration of the university and reorganized the alumni association and advancement programs. 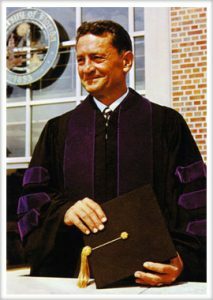 When he announced his resignation in 1973, returning to his law practice and taking up cattle ranching, he left a legacy of fiscal strength and diversity at UF. 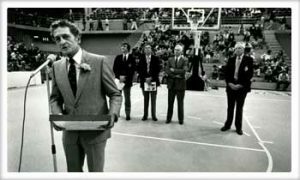 The Stephen C. O’Connell Center was dedicated in 1981 to recognize his many years of devoted service. O’Connell died at his ranch home on April 13, 2001. He is survived by his wife, UF Board of Trustee member Cynthia Bowling O’Connell, three children and eight grandchildren. We’ve had lots of changes around here! The timeline will be updated soon. The Harlem Globetrotters make the first of their 18 eventual appearances in the O’Connell Center, becoming the first touring event to appear in the O’Dome after its opening. 1991 Garth Brooks concert sells out in 19 minutes, the fastest sellout in O’Dome history. After announcing her farewell tour almost two years prior, Cher took the stage and performed in front of over 7,000. 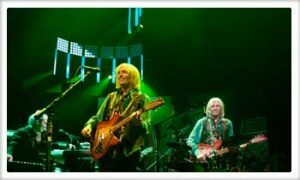 Tom Petty and the Heartbreakers’ hold a sellout 30th anniversary concert. Dance Marathon raised a record-breaking $866,726.15 for the Children’s Miracle Network. 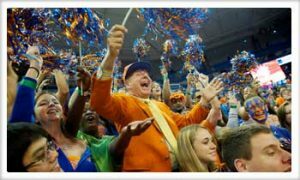 Florida men’s basketball defeats Tennessee, 67-41, to set a new school record with its 25th consecutive home win. 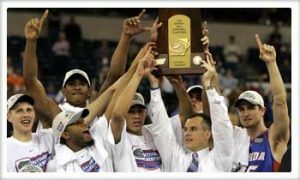 The Gators extended their streak to 32, completing its second consecutive season undefeated at the O’Connell Center. Dance Marathon 2014 event brought in a staggering $1,528,330 after raising $1,169,722 in 2013 and $866,726 in 2012. 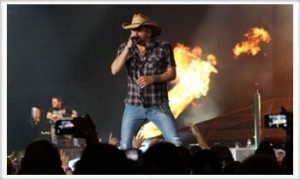 Jason Aldean headed back the O’Connell Center to perform a sold-out show in one of the venues he played when he got his start. 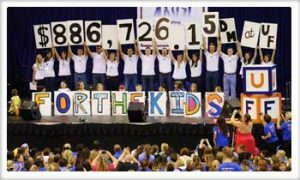 Dance Marathon continues breaking records as a Children’s Miracle Network fundraiser, making huge strides each of the past several years. The 2015 event brought in a staggering $2,015,307 after raising $1,528,330 in 2014 and $1,169,722 in 2013.